Our home is finally coming together and starting to feel like a cozy home with our personal touch on it. For so long, we just had our belongings placed randomly here and there from our effort to unpack, but nothing felt like it was in place. Since the holidays are long over and all the decor is packed away, I've slowly been more thoughtful about what we need to finish off our spaces. Of course, I'm still in the midst of finishing our kitchen cabinet paint job, but I finally got a hold on the dining room. 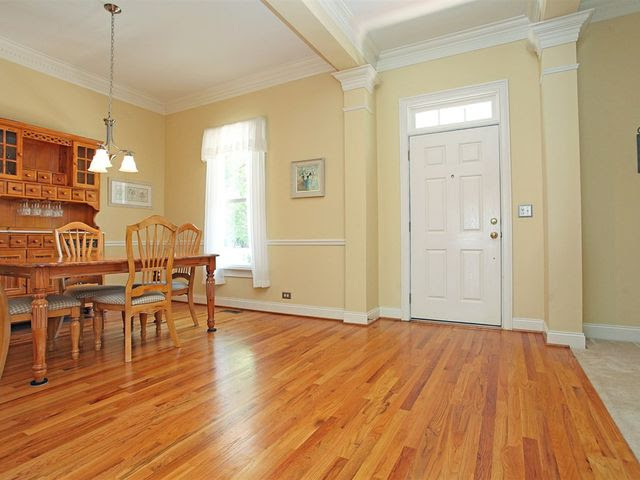 This room is just immediately to your right when you walk in our home. It's small, but serves it purpose even if we don't eat in there regularly. We used our old kitchen table since the dimensions fit nicely and it would have been too big for our breakfast nook. I dug out a mirror and some sconces that I had packed away since we moved from our townhouse four years ago. I always wanted to use them in our previous dining room, but we never got a table for the room and it remained empty for the whole time we lived there... which might be why I wanted to finish this one so bad! We installed the new light fixture the weekend we moved in and it works perfectly with the vibe of the room. You know I'm a sucker for all things coastal, bright, and textured. I love mixing wood tones, greenery, and my classic blue and white porcelain. 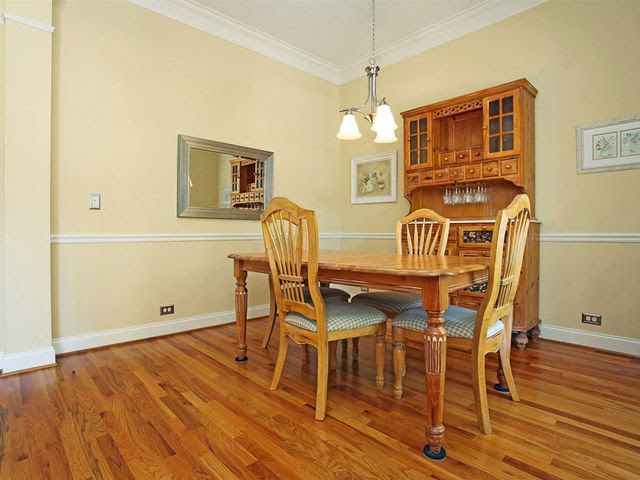 We painted below the chair rail a bright white and still have framing out the wainscoting on our to-do list. The paint above is BM Lily White, and it definitely is more of a light blue than white! It feels bright and adds color without being too saturated or too blue. We ended up placing our industrial bookcase in the dining room since our buffet fit nicely in our kitchen and we already had a built in in our great room. It was a little difficult to style, but we are getting there. I flanked each side with a black and white edited iPhone pic of the girls from our visits to the beach. I love the personal touch of family photos without them being too family photoshoot. The black frames fit right in with the wrought iron light fixture, bookcase, and Pottery Barn sconces. I'm on the lookout for a plant stand and a fern to fill in the back corner. And I would really love to find or build a bench for the front side of the dining table, if you spot a seagrass one let me know! It would really help lighten it up. Add some seating and move the two chairs to the head of the table. I also think it will make the table a bit more inviting from when you walk in the door or other direction from the kitchen. Over by our window, we hung a set of breezy white curtains and placed our old wine bar. This was one of our very first furniture purchases together and for an assemble yourself Crate & Barrel piece, it's held up quite nicely over the last nine years. It fits perfectly in the space and is a great way to keep our wine bottles, stemware, and bar tools nicely organized and stored in an accessible spot. Let's just say the upper shelves of 42" cabinets are not a 5'2" girl's best friend. It's also the perfect space for styling vignettes. 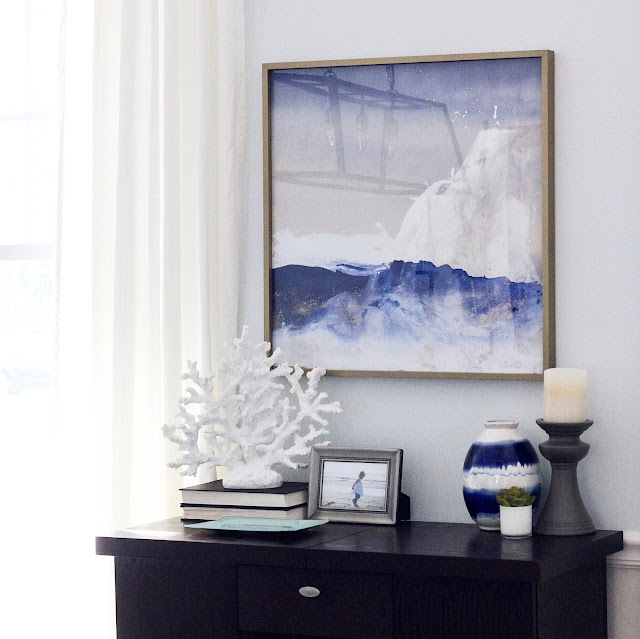 A collection of items we've had on hand came together so nicely with our brand new art. I have been selecting abstract art that evokes the sea on my inspiration boards for ages, I was so happy when I finally was able to pick a piece from Minted's Art Marketplace. I love that Minted supports independent artists and is frequently adding new offerings. In fact, the print I chose, Neptune by Julia Contacessi, is a limited edition which is always something special and unique. I love the colors and movement in the print. I wasn't sure if I wanted it matted or with a border, but I kind of love the full bleed paired with the thin matte brass frame. The mixed metal definitely keeps the room from all being all matchy and provides a bit of extra texture and color and pairs so lovely with the artwork itself. 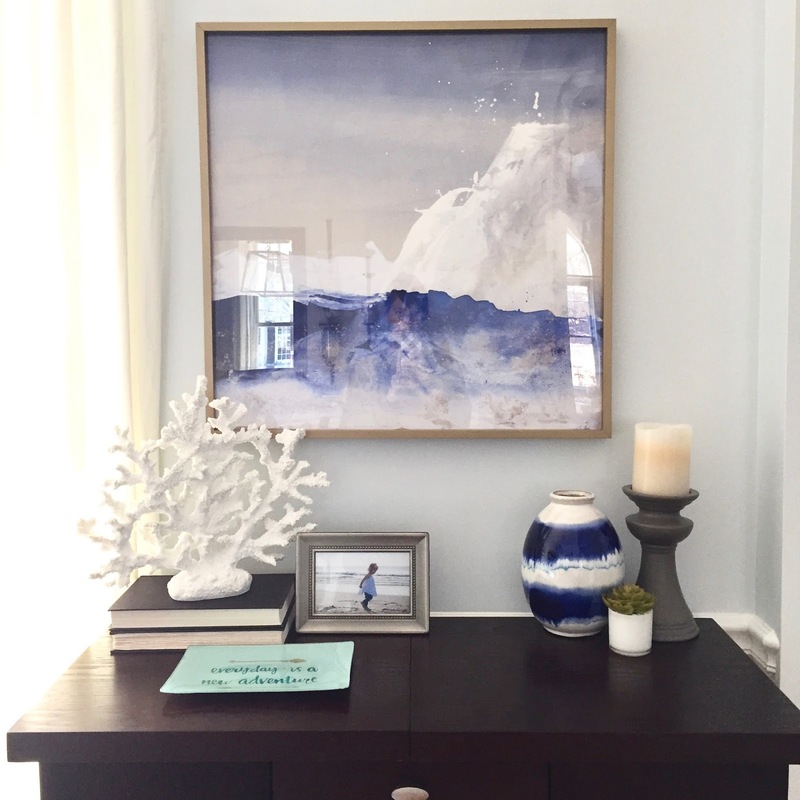 Honestly, this print could have worked in so many spaces in our home since we are carrying the coastal vibe throughout, but I'm so happy I was able to finish off this space. Especially since it's the first view guests see when stepping through the door. The 24x24" size is perfect for the space and it was ready to hang when it arrived. Easy peasy. Perfect. Do you have a space you are dying to finish off in your home? Is there a certain style of art you'd love to own? 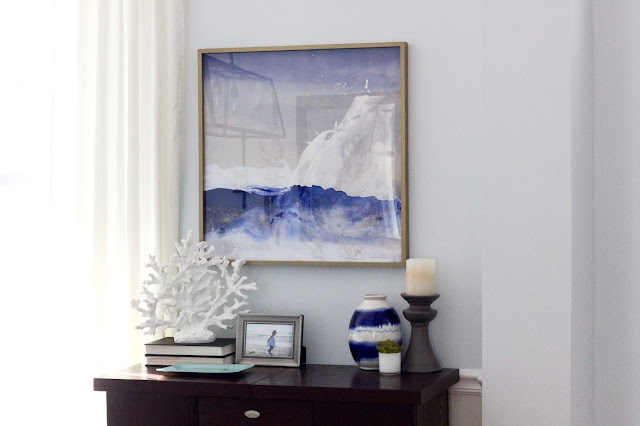 Check out Minted's fine art selection this weekend and take advantage of Free Shipping with code SHIPFREE.